Kollu has so many health benefits and the regular intake helps to flush out the worm infections, it regulates the digestive system and prevents acidity and flatulence. They say it helps to treat menstural problems like irrregular periods and heavy bleeding. By adding horse gram to our daily diet in the form of sprouts, boiled water or rasam, or powder to watch the results. About this recipe it is so simple to make i am sharing this recipe for the Navarathri Hindu festival. 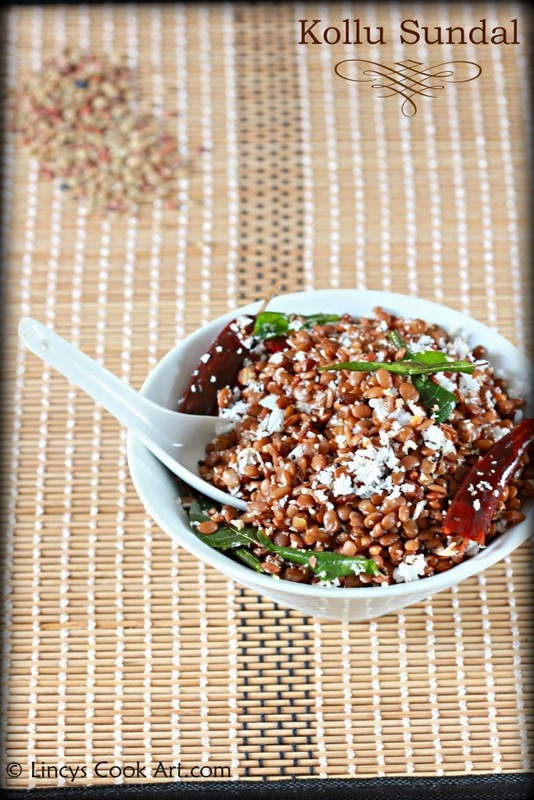 The sundal recipe is famous for Navarathri. On all the nine days in every home they prepare different types of sundal to offer god. Today i am sharing with you the healthy sundal variety. So try this recipe for this navarathri and keep the family members healthy. Soak the horse gram overnight and wash well using lots of water. You can find small stones in this. So add lots of water so that the stones starts to settle at the bottom. Now you can transfer the kollu from top by gently shaking the vessel into the pressure cooker. Once the pressure releases drain the cooked water from kollu and reserve it to make kollu rasam. Heat oil in a pan and add mustard seeds and Urad dhal. When the mustard seeds crackles and the urad dhal gets golden brown colour add the broken dried red chillies and curry leaves. Add the cooked kollu and mix well in that tempered oil. Once the mixture gets heated up add the coconut and mix well. Very healthy snack; love it. healthy sundal.. looks very nice.. Very addictive and nutritious snacks, i can happily have some.